ChemAxon's Calculator (cxcalc) is a really useful command line program in Marvin Beans and JChem that performs chemical calculations using calculator plugins. There are a lot of calculations provided by ChemAxon (e.g. charge, pKa, logP, logD), and others can be added by writing custom plugins, perhaps one of the most useful is the ability to calculate the acidic and basic pKa. Calculation of pKa is essential to get a reasonable hold on the LogD of a molecule. LogD is probably the most critical physicochemical property in drug discovery, it has a major influence on absorption, cell penetration, metabolism, CYP450 inhibition and induction, PGP transporter activity and activity at the HERG channel, and is often a critical component of any structure activity relationship. You will need to check the path to cxcalc, it seems to vary depending on version. Where apKa1 is the most acid pka, bpKa1 the most basic and ,atoms the atom numbers that are ionised. The Vortex script is shown below the first part gets the path to the sdf file as before and constructs the cxcalc script. The output is then parsed, using \n to separate each line and \t to separate each value on each line. The first line contains the column names and these are used to populate the Vortex columns, the other lines contain the data and this is used to populate the table. The result can be seen in the image below. Cxcalc can be used to calculate other properties such as logP, logD, mass, acceptorcount, donorcount, polarsurfacearea, and rotatablebondcount and the script can be modified to calculate all of these properties. So simply changing the part of the script that calls cxcalc as shown below calculates a new set of properties, and because the output follows a standard format the rest of the script that parses the output to generate the column headings, and populate the data fields etc. does not need to be altered. One of really nice benefits of having command line tools that give the results in a consistent format is that it becomes trivial to add additional properties, simply add them to the command below and the output should be parsed and additional columns added to Vortex without the need to modify the rest of the script. I often need to simply classify molecules as acid, base, neutral or zwitterion, so I’ve updated the script to create another column containing a text annotation. 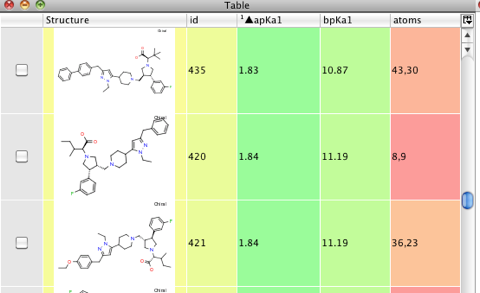 First we need to check if a Pka exists and then score it based on the value of both the calculated acid and basic pka. We then annotate on the resulting scores. Chemists at Cancer Research Technology use this for both sdf’s and from Brower created Vortex workspaces. I can’t test it but it looks OK, but you may need to check the path addressing.